Fairmont Hot Springs, located in the B.C. Rockies, is a popular recreational spot with young and old alike. Fairmont with the largest odourless hot pools in Canada is an ideal place to relax and enjoy some of the most magnificent scenery in British Columbia. The first European to settle at Fairmont, was George Geary in 1887. When Sam Brewer became the owner, this site became a rest spot for the stage coaches that transported people and express up and down the Columbia Valley. Later, when W. H. Holland and his family purchased the place, they developed the property as a ranch and resort. The property has changed hands. 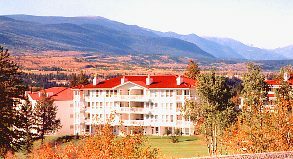 Nevertheless, the development has continued and today, Fairmont Hot Springs is well known for its therapeutic waters and spa and the other recreational facilities. Climate: Moderate. Sunny, warm summers. Cold, snowy winters. Access: Fairmont Hot Springs is in the Rock Mountain Trench on Highway 93 and 95, between the towns of Canal Flats and Windermere. 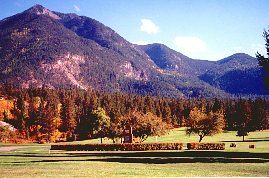 The city of Cranbrook is 112 km (69 km.) south and Golden is 148 km (92 mi.) north. 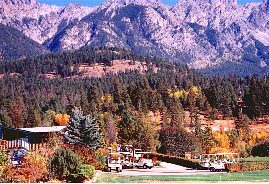 Recreation Facilities/Activities: hot pools and spa; golfing; hiking; swimming; boating; biking; horseback riding; fishing; heli-sightseeing; downhill and cross country skiing. Local Attractions: large odourless hot pools; two excellent golf courses; Windermere Lake and the Columbia River. Accommodations: resort that can hold from 10 to 300. The near by towns offer motels, hotels and RV and tenting campgrounds.